Loganair is a Scottish regional airline that until September 2017 operates under the Flybe Franchise. After this date it will become an independent airline. It oversees flights between 28 destinations in the UK, Republic of Ireland and Norway. This airline has a below average rate of delayed flights, but an above average rate of cancelled flights. If you’re subjected to delays or cancellations with Loganair we will help you stand up for your rights. With our simple, fast online calculator you can check if you’re eligible for compensation for free and directly submit your claim with us online. Under which circumstances are flight delays eligible for compensation? 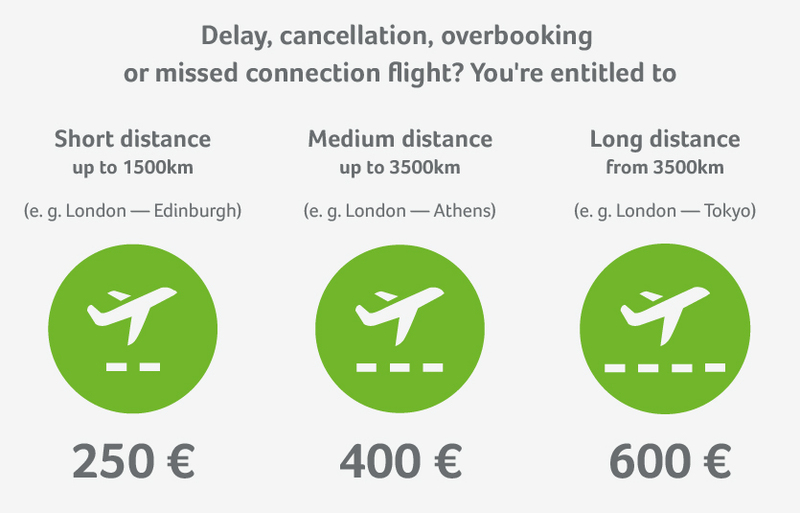 Regardless of the distance, if your flight is delayed for more than 5 hours the airline is obliged to either allow you to cancel your flight and reimburse you for the costs, or offer you alternative transportation. If your flight is postponed until the following day, the airline must accommodate you in a hotel and provide transportation to and from the hotel and airport. Contact the airline directly and ask for this to be confirmed in writing. Important: Don’t put up with any excuses! Vouchers for hotels or food don’t negate the airline’s responsibility to issue your compensation. Thanks to our expertise, we enforce your right to compensation with a very high success rate. That’s why we are able to promise a completely free service if your case is unsuccessful! Loganair operated 19,500 flights in 2016 across 28 airports in the UK, Norway and the Republic of Ireland. It has a fleet of 30 mixed aircraft and flies the world’s shortest route - between Westray and Papa Westray - which on a good day can be done in just 47 seconds! In 2016 outright cancellations with Loganair were more prominent than if you flew with some of their counterparts. The figures for delayed flights make for better reading, and as such the airline ranks somewhere in the middle for overall punctuality. Flightright experiences an average level of cooperation from Loganair when pursuing customers’ due compensation. If needed we will enforce the cases in court. As of August 2017, Loganair does not operate an online check-in. The check-in is done in person and this is possible 90 minutes prior to departure and as late as 30 from departure. As Loganair is soon to break from Flybe (some time in September 2017), it will be worth visiting their website to see if their check-in policy has changed. More information about Loganair can be found here.